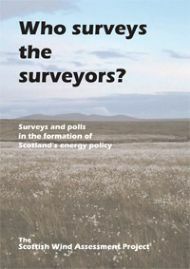 Surveys and opinion polls are regularly quoted as proof of public support for wind power and are referred to in proceedings at Westminster and Holyrood, in statements by ministers, civil servants and planners, in wind-industry marketing and even in planning applications. The press tends to take the claims made in reports of official and industry sponsored energy-related surveys at face value. Opponents of wind-power on the other hand allege that they serve to mould rather than measure public opinion. The market research industry acknowledges that surveys or opinion polls record at best a snapshot in time of the views they seek to measure and should not be regarded as long-term indicators. It is, therefore, proper to examine whether the surveys are sufficiently robust for the uses to which they are being put. SWAP researchers studied eleven that have either featured in the renewable energy debate or were used to justify government energy policy. This report presents their findings.